All the Schools are now back for Autumn and we are getting ready for our first Young Arts sessions on 22 September. Book your place now to avoid disappointment as some courses may be cancelled if they don’t reach minimum numbers. 25 week Saturday Arts Clubs cover a wide range of Art & Design subjects and are available for ages 9-11 & 11-13 years. 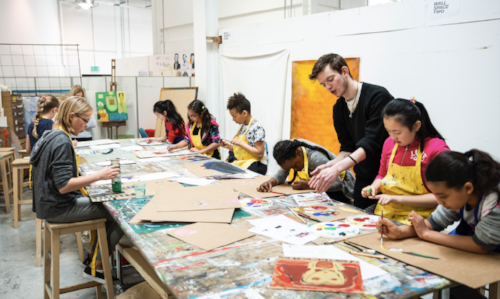 Arts mediums will be painting, printmaking, fashion, drawing, construction, photography among others and the courses will feature at least one gallery visit or visiting artist workshop. There will be an end of year exhibition in May and a pop up Christmas event for parents and friends. 10 week Young Creators Clubs in Media, Art or Design are available for ages 14-16 years. Theses specialise in one Art based subject area. Young Creators, Art Club 14-16yrs (Sept 2018) Painting, drawing, printmaking with a 1 off workshop with a visiting artist. Young Creators, Design Club 14-16yrs (Sept 2018) Fashion, Zine Making and product photography with a visit to our costume department at our HE campus. Young Creators, Media Club 14-16yrs (Sept 2018) This term will focus on photography with a view to participants entering the Methods Making Madness – Young Photographers Competition. You will use mainly digital photography but the course will include a visit to our HE campus with a darkroom and lighting studio tour. Plymouth College of Art is a specialist independent art school offering a range of Undergraduate, Postgraduate and Pre-Degree programmesacross Art, Design, and Digital Media. We also run public exhibition space The Gallery as well as FabLab Plymouth and offer short courses, Young Arts Club, masterclasses – and more. Find out more about us.